The altar for burning animals and grain (which would otherwise be food for people) is outside the Tent of Meeting that the Israelites construct in the wilderness of Sinai. 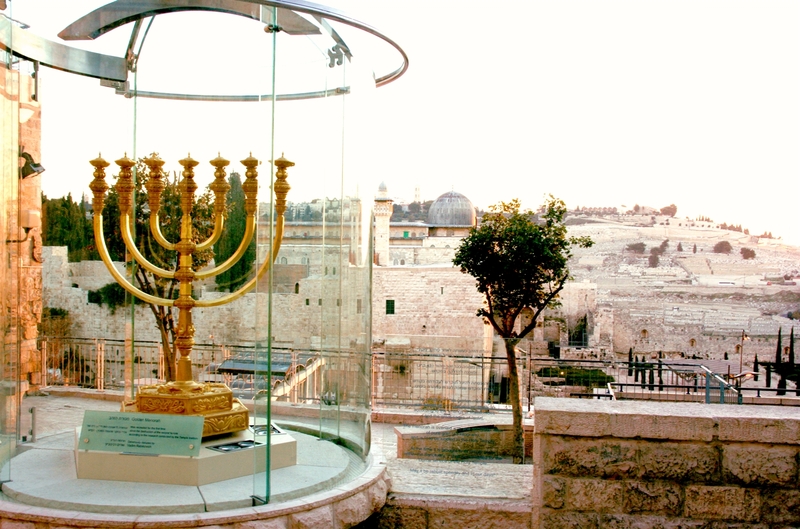 The incense altar is inside, right in front of the Holy of Holies. All the Israelites worship God by bringing food offerings for the priests to burn on the outdoor altar. 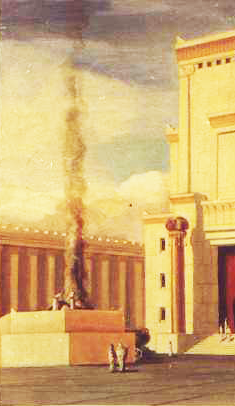 Only the high priest, Aaron, burns spices on the incense altar for God. Food offerings are sent up in smoke for various reasons. Some offerings express gratitude to God, some atone for transgressing God’s rules, some mark a change in ritual status, and some observe holy days. The fragrance of the incense, however, is intended only to honor and please God. The Israelites deported to Babylon were not sure what to do. Should they continue sending up smoke to God, even without the temple, the food altar, or the incense altar? Or should they use another approach? Psalm 141 is a plea for God to help the psalmist avoid harmful speech and bad company. The psalm opens with a request that this prayer be considered as a substitute for making smoke. God, I called You. Hurry to me! Listen to my voice when I call to You! After the Persians conquered Babylon, some of the Israelites returned to Jerusalem and built a second temple in 516 B.C.E. They reinstituted the sacrificial system in their new temple, making both an outside altar for burning food offerings and an inside altar for incense. This type of worship continued until the Romans destroyed the second temple in 70 C.E. Similarly, in traditional prayer books the Amidah3 includes this request: “And return the service to the inner sanctum of Your house, and the fire-offerings of Israel, and their prayer, with love, accepting it with favor.” According to this tradition, prayer is good, but prayer and smoke together are better. Many liberal prayer books produced in the last century or so omit or reinterpret this prayer in the Amidah, so as to avoid praying for either reinstituting animal sacrifices or building a third temple. Slaughter and grain offering You do not want. Rising-offerings and guilt-offerings You do not request. The speaker in Psalm 40 insists that God does not want smoke, only words. Nothing can make this prophetic poet recant; he will not “eat his lips”. I almost envy the simplicity of the early Israelite religion, in which people and priests burn something to make a column of smoke rise up to God in the sky or “heavens”, and God sends down a column of divine smoke (described as cloud and fire) to guide the people. Personally, I could not even imitate this process by burning incense, since I am allergic to any type of smoke. And these days, columns of cloud and fire do not descend from the sky; we only get lightning and general precipitation. But I do pray to God with words, for all the reasons the ancient Israelites made smoke: to express gratitude, to ask for forgiveness and self-improvement, to observe holy days, and just to honor the divine. And though I often say, or sing, the words out loud, I do not pray to a God in the sky, but to a divine source I encounter “inside my guts”, like the author of Psalm 40. I was brought up to be an atheist; I did not begin praying until I was 32. My life for the past 30 years has been deeper, thanks to prayer; I have become more grateful, less egotistical, and more accepting. And, God willing, I can continue to improve. May everyone who would benefit from a prayer practice discover a good one. 1 See my post Terumah & Psalm 74: Second Home about the Tent of Meeting, and my post Pinchas: Aromatherapy about smoke from animal sacrifices. 2 The Hebrew Bible describes two postures for prayer. Prostration—bowing until you lie face down on the ground) indicates submission and the willingness to receive any word God might send you. Raising your hands, palms up, toward the sky (with or without kneeling) indicates a petitionary prayer, in which you are asking God for something. 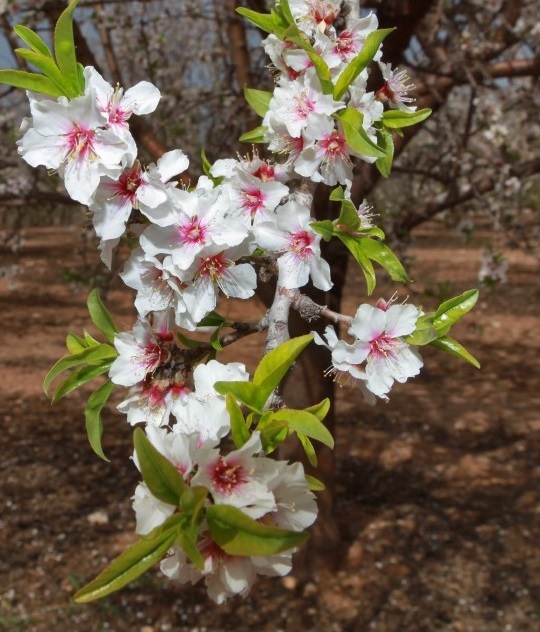 3 This prayer, called the Avodah (“Service”), is number 5 in the Shabbat Amidah, and number 17 in the longer weekday Amidah. Every week of the year has its own Torah portion (a reading from the first five books of the Bible) and its own haftarah (an accompanying reading from the books of the prophets). This week the Torah portion is Tetzavveh (Exodus 27:20-30:10), and the haftarah is Ezekiel 43:10-27.
nikhlemu (נִכְלְמוּ) = they are humiliated, etc. 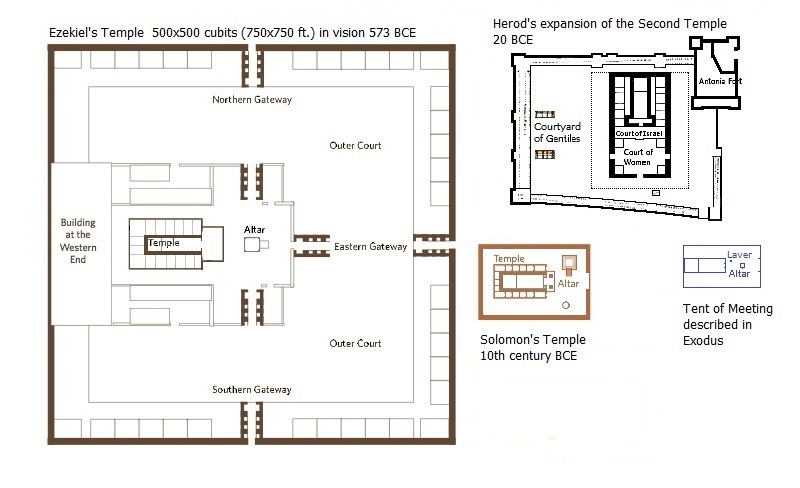 “The House” refers to a building for the God of Israel: Ezekiel’s vision of a new temple to replace the one that King Solomon erected and King Nebuchadnezzar of Babylon razed when he destroyed Jerusalem in 587 B.C.E. The two clauses about being humiliated are difficult to interpret, since in the first one God predicts the Israelites will be humiliated, and in the second one God says “if they are humiliated”. According to the standards of the sixth century B.C.E., there is no question that the Israelites of Judah have been publicly humiliated by the time of this prophecy, dated to the fourteenth year after the fall of Jerusalem. The kingdom of Judah had been a vassal state of the Neo-Babylonian Empire, paying annual tribute to King Nebuchadnezzar but managing its internal affairs as an independent country. 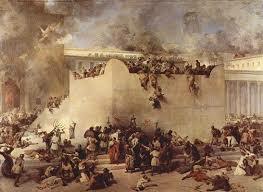 Then King Yehoyachim of Judah rebelled, and the Babylonian army besieged his capital, Jerusalem. His son Yehoyachin (a.k.a. Jeconiah) surrendered in 597 B.C.E. and saved the city. Nebuchadnezzar deported him and about 3,000 of Jerusalem’s leading citizens—including Ezekiel—to Babylon. Nebuchadnezzar installed Yehoyachin’s uncle Zedekiah as Judah’s king, and Judah resumed its status as a Babylonian vassal state. 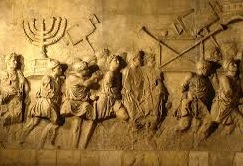 Destruction of Jerusalem in 587 B.C.E. The Israelites remaining in Judah still had their own king, and a temple for their own god. But eight years later Zedekiah rebelled (after making a secret treaty with Egypt), and the Babylonian army surrounded Jerusalem again. This time the siege ended in the capture of Jerusalem, the execution of Judah’s last king, and the destruction of the capital and its temple—in other words, the complete humiliation of Judah. What caused this humiliation? One might blame Nebuchadnezzar for his determination to expand his empire, or King Zedekiah for foolishly rebelling, or even Egypt for marching toward Judah at Zedekiah’s instigation, then succumbing to the Babylonian army before they reached Jerusalem. But in the passage above, God says twice that the humiliation of the Israelites happened because of their own sins—and God is not referring to their kings’ rebellions against Babylon. The sin of the Israelites is building shrines for idols and other gods—and in the worst possible place. God decided to destroy Jerusalem and its temple because of the people’s apostasy, and used the Babylonian army to do it. Jeremiah, who was still prophesying in Jerusalem when Ezekiel prophesied in Babylon, also said that God arranged the destruction of Jerusalem, using Nebuchadnezzar as a tool. According to both prophets, God decides which army wins in every battle involving Israelites. (See my post Jeremiah: The Ruler of All Armies.) Nebuchadnezzar did not even know the God of Israel was using him to punish the Israelites. Today this prophetic point of view seems parochial and narrow-minded. Even if God did micro-manage every battle and siege, why should all of God’s plans be about rewarding or punishing the Israelites? What about all the other peoples in the world? Other peoples had their own, albeit inferior, gods. 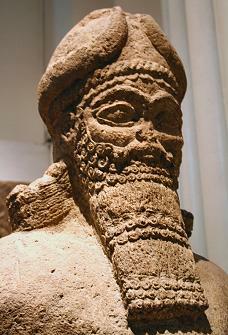 For example, the chief gods of the Neo-Babylonian Empire were Nabu and Marduk. The Bible maintains that the God of Israel was more powerful than all other gods, and that God chose the Israelites to be “His” people and commanded them not to worship any other gods. The Torah often compares this exclusive relationship between the God of Israel and the Israelites to a marriage in which the Israelites let down God by failing to be monogamous. Monotheism, the idea that there is only one god in the universe, only creeps into the Bible in a few of the many books written during the Babylonian exile in the sixth century B.C.E. The book of Ezekiel, however, sticks to the older point of view that the God of Israel is the most powerful god, not the only god. Therefore the book of Ezekiel is Judeo-centric; God interferes in the world primarily to reward or (more often) punish the Israelites. If you feel your life is unsatisfactory, even humiliating, and suspect it is because you have done something wrong, then think of your life as a temple for God’s presence. Where in your life do you exit from the presence of God? Where do you enter it? What is your overall plan for living with God? What principles do you follow as if they are divine decrees? What teachings help you to approach God? And undertake a practice, such as prayer or study, that will keep reminding you of your plan for living in God’s presence and the principles you are following. Then make it your life. 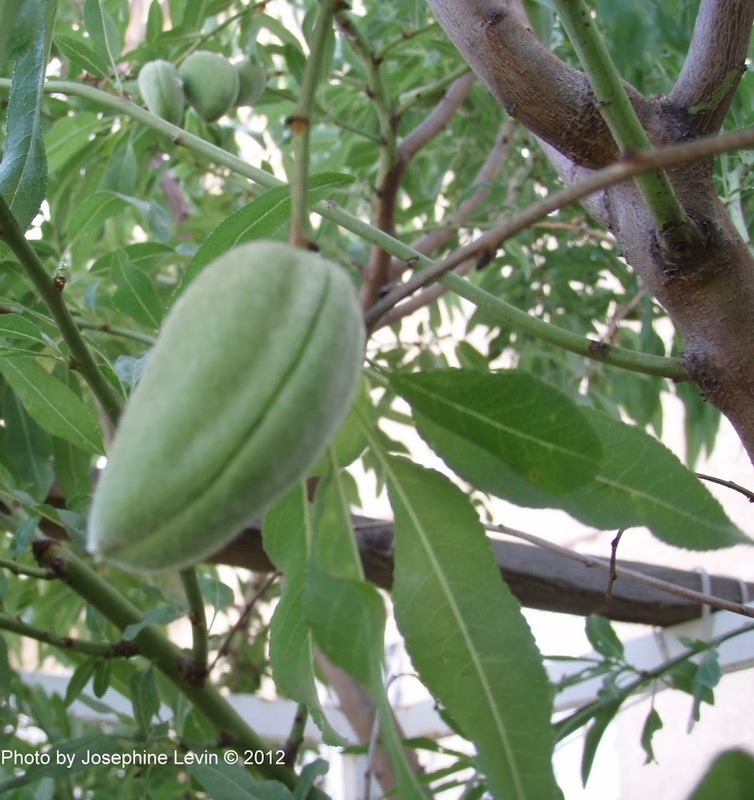 The term ohel mo-eid refers to at least two different tents in the book of Exodus/Shemot. Before Moses and the Israelites construct the sanctuary, Moses’ own tent is the Tent of Meeting. 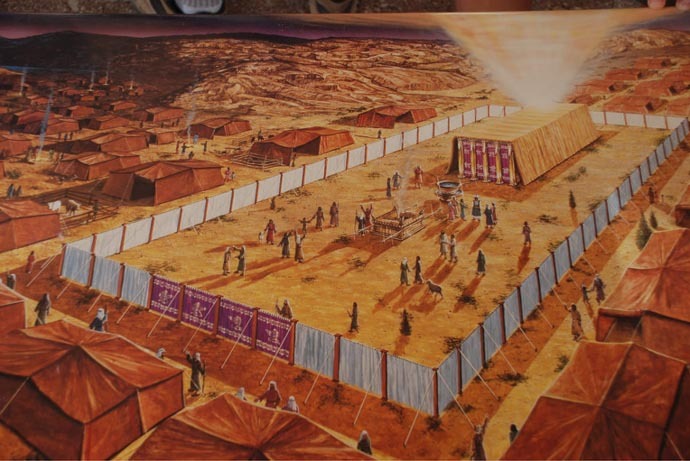 Once the sanctuary is assembled, the term “Tent of Meeting” usually refers to the tent that contains the menorah, the bread table, the incense altar, and the Holy of Holies, a curtained enclosure for the ark. In the passage above, the menorah is to be placed inside the ohel mo-eid, in front of the curtain hiding the ark. Only priests are supposed to enter the tent, the ohel mo-eid, when it is assembled. The unroofed courtyard in front of the ohel mo-eid will contain the altar for roasting or burning up various animal offerings. All the Israelites can enter the courtyard (or at least all the men; the Torah is silent about the women). 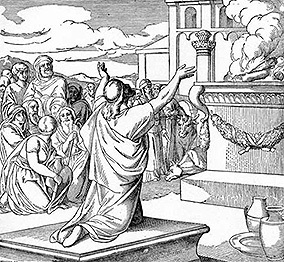 When Moses is told how to ordain Aaron and his sons as the first priests for the Israelites, God’s instructions emphasize the importance of rituals performed in front of the entrance of the ohel mo-eid. That is where the future priests will immerse themselves in water, and where they will press their hands against the head of the bull that Moses will slaughter to dedicate them to God. Being in front of the Tent of Meeting is equated with being in front of God—because the Tent of Meeting is the appointed place where God will meet with the high priests. Imagine having an appointed place to meet with God! Yet even after the ohel mo-eid is built later in the book of Exodus, and consecrated by a dazzling and deadly display of divine fire in the book of Leviticus, the Israelites in the Torah keep on alternating between accepting and rejecting their god. When the people can see the sanctuary in the center of their camp, with the pillar of divine cloud and fire hanging over it, and remember God’s fire consecrating the Tent of Meeting, why would they continue to complain about God, flout God’s rules, and even worship another god? Imagine that if you wanted to find God, you could just go to the executive meeting room in the headquarters of your ethnic group. God would hold private meetings there with those few who had appointments. But God would manifest a visible presence to anyone who came to the door—something that looked like fire or cloud, but was definitely unearthly. Would you believe God was present in the executive meeting room? Would you live in awe of the god who came to the meeting room? Would you strive to follow its rules of behavior? Or would you inquire about the gods of other ethnic groups, and wonder whether there was a more ethereal and universal god? The Israelites in the Torah never deny that there is a god who chooses to be their god and dwell in their Tent of Meeting. They only waver in their allegiance to this god. Maybe they are not always sure this particular god is the best god for them. After all, in the book of Exodus, the god of Israel does not claim to be the only god in the world, just the most powerful one. I can imagine an Israelite longing for another god, one that is less temperamental and destructive, more patient and forgiving. The idea that there is only one God for the whole world is implied in the creation stories at the beginning of the book of Genesis, but then it disappears from the Torah. True monotheism creeps into the Hebrew bible gradually, beginning with the book of Deuteronomy. Today no religion would claim that their god has an executive meeting room at the religion’s headquarters. Yet in Israel, people of different religions are still fighting for ownership over sacred places. And some religions still claim that God gives direct instructions to their own equivalent of the Israelite high priest. And there are all too many religious people who believe that the “real” God is their god. Yet I know that some people keep their own religion’s channels of connection with God, without assigning God exclusively to their own religion’s executive meeting room. I hope that someday all people will let God out of their own Tent of Meeting. Usually human beings carry on with their habitual behavior, but sometimes we have to make a deliberate decision. And we do not know whether a particular choice will lead to good or evil, to happiness or disaster. If only we knew ahead of time! The longing for foreknowledge has been with us for millennia. Each culture has had its own methods of divination, of gaining knowledge that is normally outside the human realm, in the realm of the divine. And each culture has dealt with the desire for divination in a different way. In this case, Moses is banning all the divination practices of the people surrounding the Israelites. In other places, the Torah approves of a few practices for getting a bit of divine knowledge. The two most common ways that God shares foreknowledge with humans is through dreams, and through communication with prophets. Occasionally a person can take the initiative by casting lots, or by consulting a mysterious object or pair of objects worn by the high priest: the urim and tummim hidden within the high priest’s breast-pouch. These items are first introduced in this week’s Torah portion, Tetzavveh (You shall command), in which God tells Moses everything the high priest shall wear. Over his sky-blue robe, the priest must wear an eifod, a kind of tabard with shoulder-straps and sewn-in ties at the waist. A chosen, a square pouch, will hang from the shoulder-straps of the eifod, secured on the high priest’s breast. This breast-pouch will be folded at the bottom, and twelve gems will be set into the front. Each gem will be engraved with the name of one of the tribes of Israel. Obviously a high priest could not carry firelight and wholeness in a pouch on his chest; the names of the actual items are symbolic. But what do they mean? Throughout the book of Isaiah, urim means “fires” or “firelight”, not an object worn by a high priest. In Ezekiel, ur is a destroying fire. 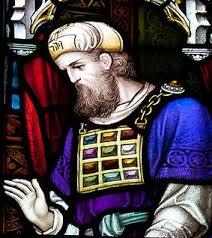 Everywhere else in the Hebrew Bible, the word urim refers to the item worn by the high priest. Traditional commentary says the word urim means light, illumination, clarity, because it has the same root letters as the word or = light. Some modern language scholars speculate that urim is a misspelling of arrim = curses, so urim and tummim are “cursed and blameless”—in other words, one means bad and the other means good. Several other times in that book both Saul and David “inquire of God” in the presence of a priest with an eifod, and when David receive yes/no answers, we can assume the answers are indicated by the Urim and Tummim. But no description is given. Rashi (11th-century rabbi Shlomo Yitzchaki) suggested that the two words urim and tummim were written on a single piece of parchment, and the high priest would look down through the open top of his breast-pouch to see which word was facing up. In the Talmud tractate Yoma 73b, the rabbis seem to use the phrase “Urim and Tummim” interchangeably with the phrase “Breast-pouch of the Law”. Some speculate that the names of the twelve tribes were inscribed on the Urim and Tummim, and the letters lit up or moved around to create an oracular message. Others say the Urim and Tummim caused the stones on the front of the breast-pouch to light up, and the message could be deciphered from the pattern of flashing lights. The important thing was that both the person with the question and the high priest had to direct their minds toward God. When the Torah first introduces the Urim and Tummim, in this week’s Torah portion, it says “they will be over the heart of Aaron when he comes before God”—like the gems representing twelve tribes of Israel. Maybe the primary purpose of the Urim and Tummim is not to enable divination, but to keep light and wholeness in the high priest’s awareness whenever he approaches God. Even today, people who want to make the right decision resort to dubious divination methods. Instead of reading omens in entrails or conjuring clouds, they flip a coin, or buy something from a New Age shop, or consult a medium who channels the spirit of a dead person. It is hard to accept that we cannot have foreknowledge, only good guesses. Yet we can answer the question “What should I do?” without knowing the outcome of our choice. And when our intuitions are not clear, we can use approaches similar to the kind of “divination” the Torah approves of. Dreams still help by connecting us with hidden parts of ourselves that are connected with the divine. And we can improve our conscious thought by keeping certain ideas in our awareness, carrying them upon our hearts like high priests. We can consciously stay in touch with urim, the light shed by the fire of our passions; tummim, the continual effort to complete ourselves and become whole; and on the outside, the gemstones of our own tribes, our own families, friends, and communities. pa-amon = a bell, something that strikes. 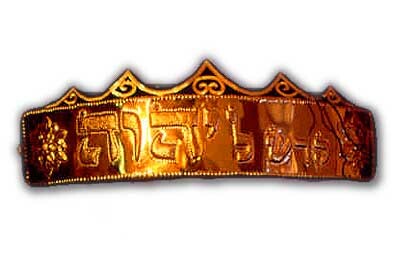 The high priest’s costume, as prescribed in this week’s Torah portion, Tetzavveh (“You will command”), is elaborate, splendid, and magical, from the golden forehead-piece engraved with the words meaning “Holy for God”, all the way down to the hem of the long blue robe, on which are sewn alternating bells of gold and pomegranates of blue, purple, and red wool. The mere sight of the high priest in this magnificent garb would inspire the community with the proper awe and reverence. 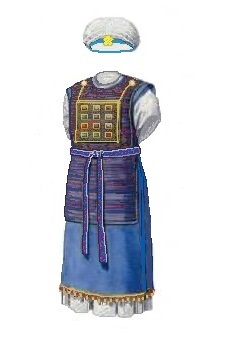 And wearing these unique objects would remind the high priest that he is dedicated to continuous service of God, and must act accordingly. But not just any set of grand clothes and accessories will do. Each item prescribed for the high priest can have other meanings and functions. When I reread the Torah portion this week, I was fascinated by the bells, the only item that is intended to be heard as well as seen. Why are bells required on Aaron’s hem? The Torah says only that their sound must be heard when he goes in and out of the sacred space. It does not specify who must hear the ringing. One theory is that the other priests must hear, so they will know when the high priest is in the sanctuary, and they can leave him in privacy until he comes out again. According to Rabbi Elie Munk, the high priest needed to be alone in this area to serve God properly. 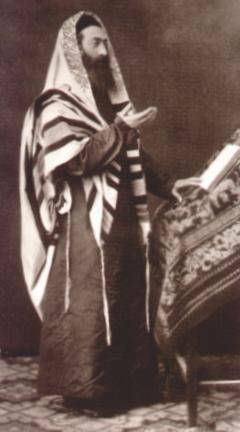 According to 19th-century rabbi Samson R. Hirsch, the whole community needed to hear the high priest approaching and departing from God’s presence, so they would be heartened and reassured to know he was once again acting on their behalf. Another theory is that God must hear the bells ring. The verse in the Torah implies that the ringing somehow protects the high priest from death in the presence of God. 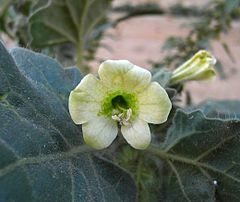 Devotees of other religions rang bells in order to ward off unfriendly spirits, so the ancient Israelites might have associated bells with magical protection against dangerous gods. If one reads the Torah literally, God comes across as an anthropomorphic character who is easily angered and inflicts deadly plagues on thousands without a second thought. Yet this God is the one who tells Moses how the high priest’s gear must be made, including the detail about the bells around the hem. Maybe the sound of bells is intended to remind God that whatever personal shortcomings the high priest has, his life is nevertheless important to the community. Rashi said that the high priest would die if he entered the Sanctuary without wearing every one of the holy items specified, including the bells. Serving God is serious business, and the priests had to follow all the rules; any lapse was punishable by death. But I think the verse does not threaten death for omitting any one of a long list of required items. I think the death threat specifies that the sound of the bells around the high priest’s hem must be heard, or else. This means that merely wearing a robe with bells sewn around the bottom is not enough. After all, the bells will chime only when the high priest is walking. The word for bell, pa-amon, comes from the same root as the word pa-am, which means knocking, beating, striking, or striding. If the high priest stands still, the bells will not be heard. If he tiptoes carefully in and out of the sanctuary, the sound will be too faint to hear. He has to stride in and out for the ringing to be heard. Perhaps the instruction about the sound of the bells means that in order to do the highest service to God, one must not be timid. One must enter the sacred space of prayer, or any other spiritual practice, boldly and openly. Let the sound of your practice be heard. Make your service to the divine a part of your regular life, so that you can stride right in. Otherwise, your impulse to reach toward God will fade and die.